How Far Away is Heaven? 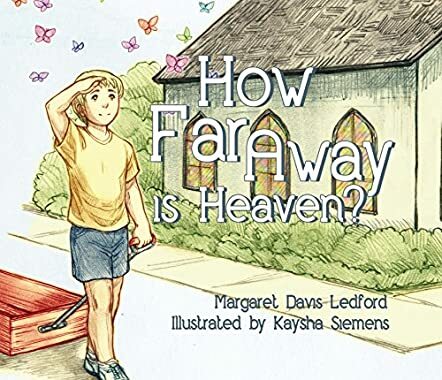 by Margaret Davis Ledford is an adorable and heartrending story that speaks about loss. Zachary goes to his Papa and Grandma’s house every day with his daddy and brother. They live two streets away. Zachary plays with Papa when his Grandma takes Austin to school. They have a good time together with their cousins in winter, making snowmen and throwing snowballs at each other. One day Papa falls sick and he is moved into a hospital. Zachary wants Papa to come home quickly. Papa is again moved to another room where Zachary is not allowed to see him. Zachary’s mother tells him that Papa has gone to heaven. Zachary wants to know how far away heaven is and he cannot wait to see his Papa in heaven. I like the way the author introduces the concept of falling sick, hospital, loss, death, Jesus, and heaven to small children. The illustrations are charming and lovable, and they give clarity to the concept and breathe life into the story and characters. It is a good storybook for bedtime story-telling and can be used for read aloud sessions in classrooms and school libraries. The story is simple and relatable and children will be able to connect well with Zachary’s character. Stories like this are good to be read out to children because, whatever the concept, it can be understood clearly through beautiful characters, moments, and illustrations. The story also highlights the importance of family and family love, and the role of grandparents in a child’s life.